Well, for all those naysayers who say I only update this site when I have a new book out, I say, how perceptive of you. It's called Differently Morphous and it's available RIGHT NOW on Audible.com. Yes indeed, as an Audible Original, the audiobook version of Differently Morphous is coming out first, with a print edition planned for further down the line (six months, probably). It's a good deal for me since there are people who routinely demand an audio version before the announcement of a new book has so much as passed me lips. Here's the blurb. After centuries in the shadows, the Ministry is forced to unmask, exposing the country's magical history - and magical citizens - to a brave new world of social media, government scrutiny, and public relations. On the trail of the killer are the Ministry's top agents: a junior operative with a photographic memory (and not much else), a couple of overgrown schoolboys with godlike powers, and a demonstrably insane magician. 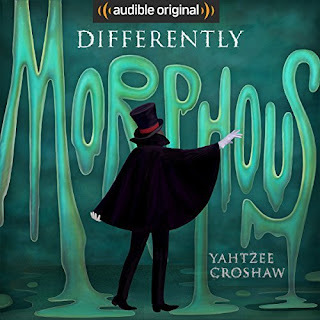 Differently Morphous is the latest and greatest tale to emerge from the mind of writer (and narrator) Yahtzee Croshaw. Some people who've read the blurb have asked me if this is some big stand against political correctness and if I'm definitively throwing in with the anti social justice brigade, but I might have to disappoint you, there. I was intending more to have equal amounts of fun with the extremes on both ends of that particular debate. Anyway, here's the link again. My girlfriend says this is my best book yet and I didn't even make her say that.